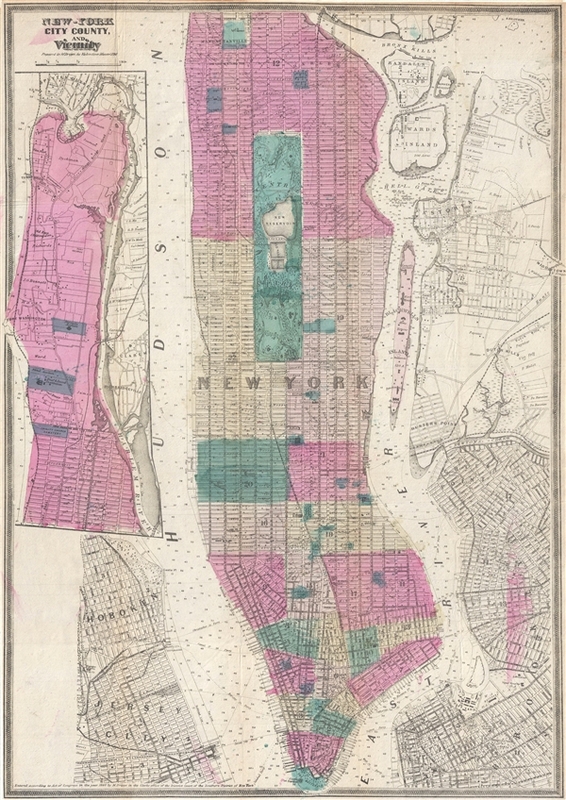 Uncommon map illustrating all of Manhattan in 1866. This is an uncommon large format 1866 map of New York City by Matthew Dripps. The map covers the entire island of Manhattan as well as parts of Brooklyn, Queens, Hoboken and Jersey City. The whole is rendered in considerable detail with all streets and even some individual buildings clearly shown. The names and tracts of Manhattan's original land owners are superimposed over the grid. Where Columbia University now stands, this map reveals a 19th century Lunatic Asylum. In Queens, Dripps labels Hunters Point and shows the beginnings of the Long Island Railroad. Astoria is well delineated. Central Park is mapped detail exhibiting the fully glory of Olmstead's plan. The mid-19th century was a dynamic period in urban development of New York City. Under the governance of Tammany Hall and the corrupt 'Boss' Tweed, New York City had become a mélange of extremes. By 1864 the Five Points had devolved into the world's most notoriously dangers slum, while further north the high ideals and design genius of Frederick Law Olmstead and Calvert Vaux created Central Park, the world's first and possibly finest planned public recreation area. Meanwhile, across the east River, Brooklyn, Greenpoint, and Williamsburg consolidated into a single city, becoming in the process the third largest city in the United States, and setting the stage for the emergence of the modern New York City. This is one of the maps that Dripps prepared for Valentine's Manual of the Corporation of the City of New York . Versions of this map appeared in several iterations throughout the 1860s. The copyright on this map is, appropriately, 1860, but a secondary date under the title reflects updates to 1866. Valentine, D., Valentine's Manual of the Corporation of the City of New York, (New York) 1866. Very good. Backed on archival tissue. Some color transference.